It was a real pleasure to see my marathon time predictor featured in The Guardian a few months back. My algorithm uses data from over a thousand runners of varying abilities who have logged their training here on Fetcheveryone, to come up with a better prediction of marathon time. You can try it here. A low value of R implies that runners can hold their pace over the longer distance, whilst higher values indicate the need to adopt a more conservative pace at marathon distance. The value of R is never less than 1, as that would imply that runners can complete marathons at a faster pace than half marathons, which makes no sense. 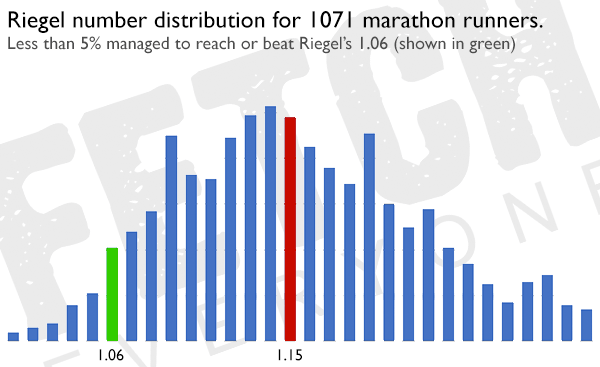 Riegel&apos;s classic formula uses R=1.06, which still provides excellent predictions for most distances even 40 years later – but out of 1071 marathon runners in our sample (all of whom had completed at least five half and five full marathons), less than 5% managed a time that kept up with Riegel&apos;s predictions. The rest fell short. Here&apos;s another way of looking at the data. If we know a runner&apos;s marathon and half marathon time, we can work out what value of R they achieved. 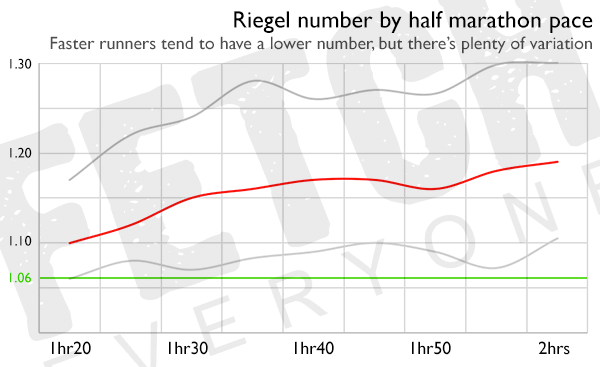 The following graph shows the number of runners who fall into each possible value of R. For Riegel&apos;s formula to work for everyone, we all need to be in the 1.06 column (shown in green), but the reality is that we see a wide range of results, and the majority are to the right of 1.06 i.e. 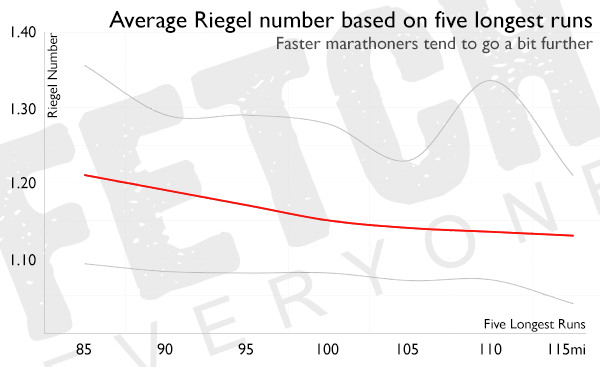 slower than Riegel&apos;s prediction. Our predictor scraps the 1.06 in favour of R=1.15 (shown in red), in the sweet spot at the heart of the graph – which instantly means that our predictions are more likely to match most runners, generating more realistic and achievable goals to aim at. 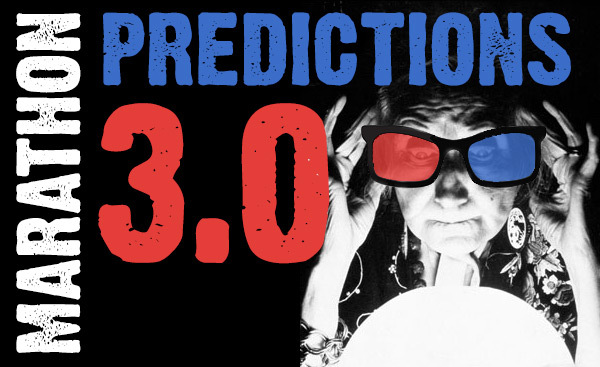 But by tuning our predictor to the middle of the data, we are left with a situation where half of all runners have a very real chance to beat that prediction – and some of those who did were keen to suggest that they&apos;d obviously done things properly! And there&apos;s probably at least some truth in that. Here&apos;s where things get interesting. We can use our red line to create two groups. To the left, the runners that converted their half marathon time into a relatively good marathon time; and to the right, those that did less well. I refuse to say &apos;badly&apos;, because that&apos;s not much fun to read if it applies to you – and anyone who&apos;s capable of running a marathon is already awesome. Fact! Let&apos;s see if we can identify any traits amongst those who beat the red line to apply to our own training to get us closer to our goals. Whether it does or not, it&apos;s not something you can train for – but it&apos;s still interesting to look at. And here&apos;s one in the eye for gender equality - female runners are BETTER at converting their half marathon times into the full marathon. In short, if a male and female runner have identical half marathon times, the female is likely to have a better marathon time. Just under half (48.5%) of our males beat the red line, compared to 55.2% of females. I also looked at whether running speed had an impact on ability to convert from half to marathon. Would a 1hr20 half marathoner fare comparatively better than a 2hr half marathoner? Unfortunately for those of us who are further back in the field, it does look as though there&apos;s a bit of a trend here. Runners in the 1hr20 bracket can hope for R=1.10, whereas 2hr runners will be better suited to using something more like R=1.19. But the red line just shows the centre ground - the two grey lines on this graph show the variation that was present in the data. 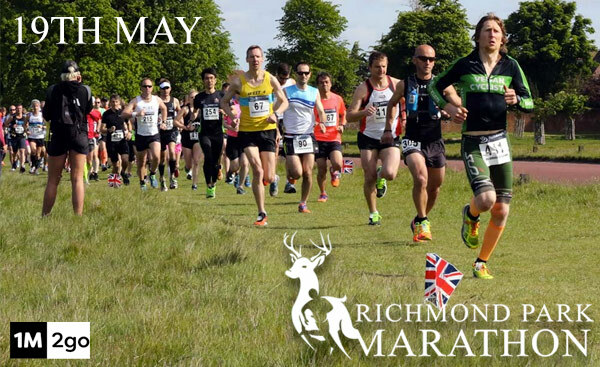 10% of our speedy 1hr20 runners managed R=1.06, but conversely 10% of them could only manage R=1.17 – and amongst the slower runners, there were some impressive conversions. I took gender and pace into account in my original calculator – so these are nothing new. It&apos;s time to dig a bit deeper. You can run the best half marathon of your life, but unless you extend your long runs and plan carefully, a marathon will eat you whole and burp out your shoelaces. Mileage is the most basic measure of marathon preparedness, and therefore a good place to start. In simple terms, runners hoping for between 2:20 and 2:39 will pack 1200 miles into the 16 weeks pre-race (75mpw), whereas a 4:40-4:59 runner typically runs 440 miles (28mpw). Before you write in, these are all averages, so there are plenty of people who do more or less than this. This gives us an (admittedly floppy) yardstick to measure our predictions against. 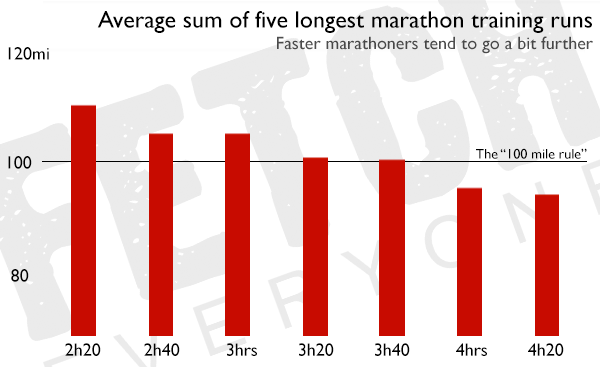 We can predict times for all our marathon runners, and calculate whether they met the mileage requirements set out in the graph above. We might expect to see that those who complete the mileage requirement tend to be better converters. The red line on the graph shows the success rate of runners who met or exceeded the mileage target; and the blue line shows the success rate of those who did not. At R=1.15, 60% of our sufficient-mileage runners reached the predicted time, compared to only 35% of those who did less mileage. In fact, at every value of R, from the very tough R=1.06, right through to a kind R=1.20, those who put the mileage in did better. It&apos;s a dance as old as time. The red line suggests that the value of R gets lower as 5L increases. 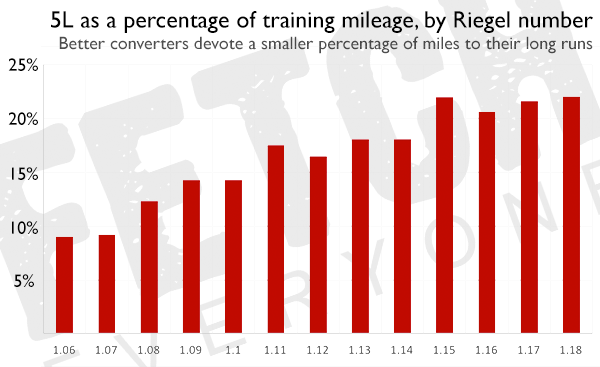 Those running 85 miles might expect R=1.21, whilst those running 115 miles will typically see R=1.13. However, there&apos;s plenty of variation. 10% of our 85 milers managed R=1.09, and conversely, 10% of our 115 milers only got R=1.21 – so although long runs are an extremely important part of marathon training, it&apos;s clear they are not a silver bullet. But then you knew that, right? There&apos;s also a tendency amongst better converters for the five longest runs to occupy a smaller percentage of your overall mileage. Here we see that for a R=1.06 runner, 5L is about 9% of the 16 week total; but for R=1.18, it&apos;s more like 22%. A successful conversion to marathon relies on a well-rounded training programme that doesn&apos;t rely solely on long runs. 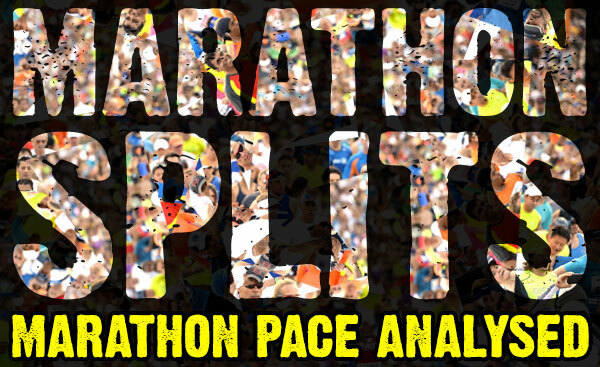 Comparing average training pace to marathon pace reveals an interesting perspective. Runners who achieve six-minute miling in their marathon will typically run over a minute per mile slower than that (72 seconds if you must know) across all their pre-race training. But a runner who ends up with a 10-minute mile marathon will actually average slightly faster than 10 minute miling in training. Could this prove relevant? Do more successful runners tend to save all their effort for racing? Does a relatively easier training regime help tune up your fat-burning systems for the long slog? Let&apos;s see what our data shows. 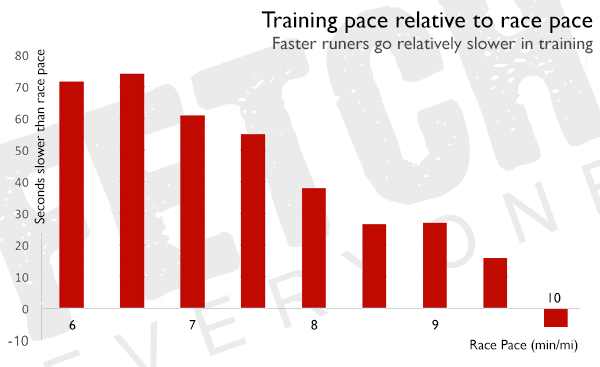 Overall, runners who train at an overall pace that&apos;s slower than their marathon pace do better. The majority of folks who beat R=1.15 (shown in red) are grouped around training about 50 seconds slower than race pace. 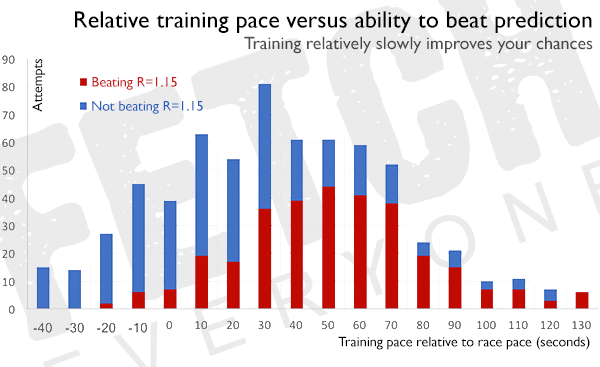 In fact, only 11% of runners who train at marathon pace or quicker will beat the R=1.15 prediction, compared to 65% of runners who run at least 30 seconds slower. 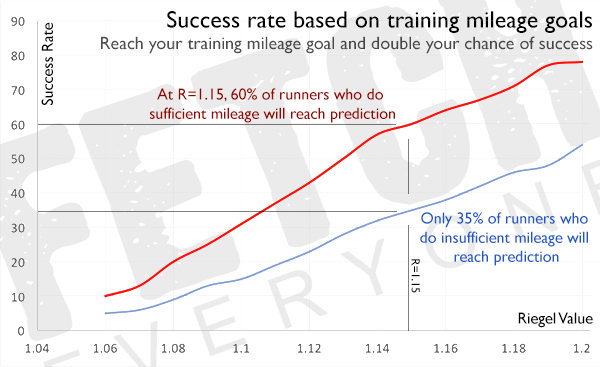 Earlier on, we discovered that quicker runners were more likely to beat the R=1.15 prediction, so to be fair we should look at the success rate for runners further down the field in isolation. I know from experience that sometimes it&apos;s difficult to slow yourself down – and surely if you can train at a particular pace, you can race at it, right? Well, still no, sadly. Within the slower half of our field, only 10% of runners who trained quicker than race pace were able to hit our R=1.15 prediction, whilst 56% of those who stayed 30 seconds or more slower, were able to reach the target. Including slower runs in your training will help your body adapt to use more fat as fuel, which will help your endurance, and push back the wall. Tapering for a marathon can be excruciating. Just at the point where you feel like things are coming together, when all those long runs are making you feel just a little bit invincible, the coaching manual says to back off. It&apos;s time to rest those legs, and give your body a chance to charge its batteries, and make its final adaptations to the training peak. 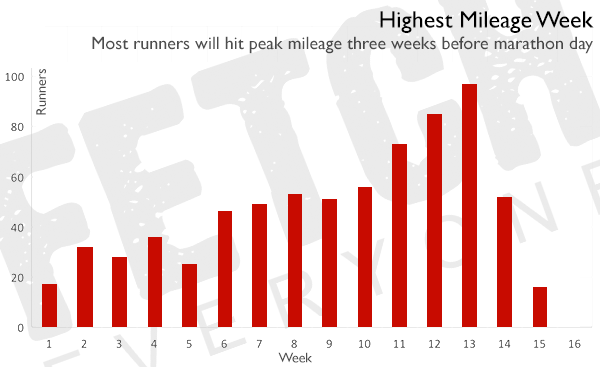 In our sample of runners, the majority did their highest mileage in week 13, leaving the traditional three week taper. 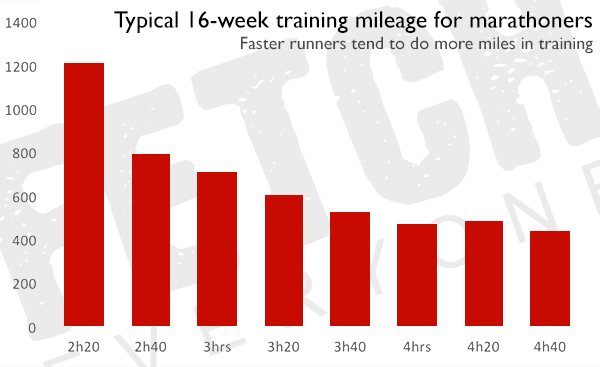 And here&apos;s how the typical three-week taper compares to the maximum mileage week, expressed as a percentage. 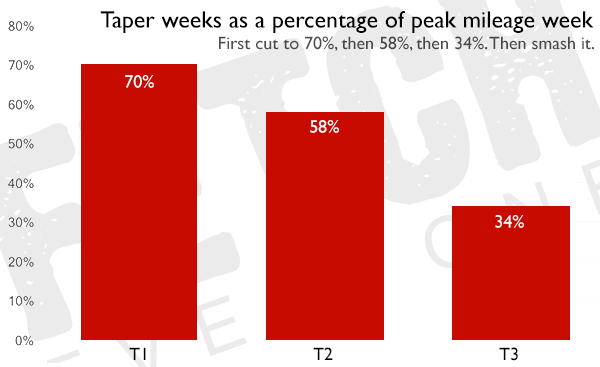 The first week (T1) is 70%, dropping to 58% in T2, and 34% in T3. Hopefully this analysis shows you that there&apos;s no one trait that will guarantee you marathon success, but several rules of thumb that come together to give you the best chance. A good training plan needs sufficient mileage, suitable long runs, and sensible effort levels that target the different energy systems in your body. Pushing yourself as hard as you can is for Hollywood montages, not for real-life training. This article will develop over time, and it&apos;s my aim to incorporate the findings into our prediction tool. 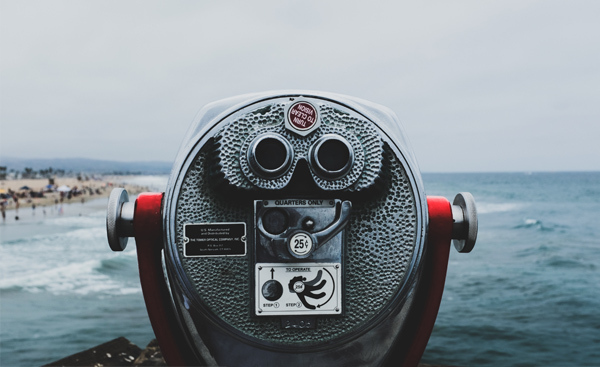 Individually, the sections above might help you to see the benefit of certain aspects of training - but it would be great to bring everything together to provide predictions that are as individual as you are. And therein lies the final and most important bit of guidance. Our charts and numbers obscure all that individual awesomeness that make you who you are. So if you are someone who does things differently, stick with it. 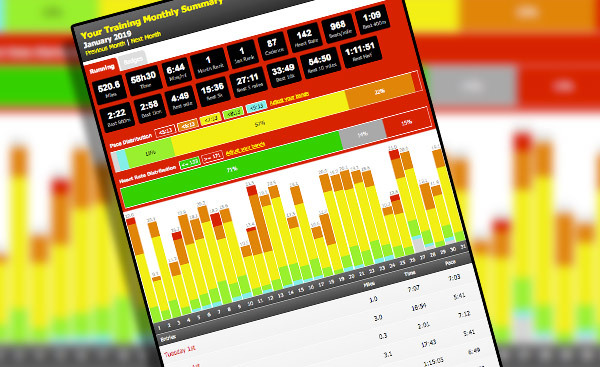 Please leave your comments and suggestions below, PLEASE share fetcheveryone.com/marathonprediction with your running friends, and please keep logging your training with us. Thanks for reading! I wish I still had access to the multi-factorial statistical experimental design software I used to use at work - could plug your data in that and get some 'perfect training' conditions to test. Some interesting analysis. But I would like to see comparisons of weekly training time rather than training miles. Us slower runners struggle to do the higher mileages because it takes too long. This is brilliant! I think the bit about training slower could be massive here. People are told it, people say they get it and then so many people do their 20 mile runs at marathon pace, completely ignoring it. I suspected that the HM to M pace relationship was not a simple parametric one like Rigels forumla but more of a decision tree. If this and this and not this then that sort of thing. This looks likely when you do the breakouts you have done. Also, dunno how easy it is to add a layer for speedwork. I suspect those of high mileage (and slow long runs) will be doing at least some of the lung busting stuff. I think you get more out of the speedwork if you are not too shattered from a faster long run. Being able to hit those sessions at full pelt has huge benefits. Anyhoo, it's probably hard to sieve that out from the training data! Personally, having run marathons for more than 25 years, I think that the critical sessions are mid-distance (10-15 miles) with long fast intervals, e.g 2mile warmup, 3 miles at 1/2 marathon pace, mile recovery, 2 miles at 10k pace, mile recovery, 1 mile at 5k pace, mile recovery, 1km at 3km pace, 2 miles cooldown. 5 long runs are important, speed work, overall mileage, but those medium distance intervals are what brings the best out of me. 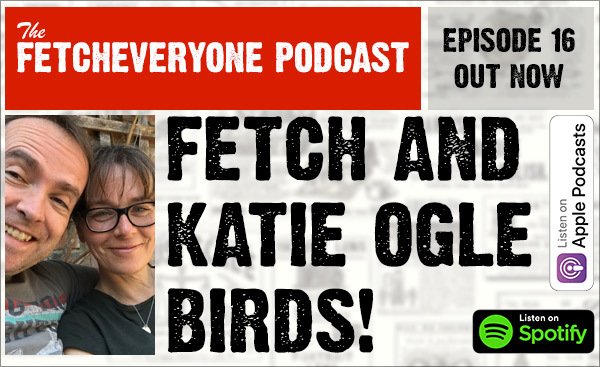 Hi Fetch, your article in the guardian is actually why I joined FE. My marathon experience is actually different from your predictor, in that my marathon time is better than any 'prediction' given be most models would give. I put this down to very specific marathon training over the last 2/3 years which has enabled me to maintain my speed that previously I had at HM distance to the Marathon, but (sadly) has not improved my HM (or shorter) times. Just an idea, mileage in built up to a marathon could be misleading? A sub-3 runner will be accumulating vast amounts of mileage in a short space of time, compare that to a 5-hr marathoner. Have you looked at time spent instead or alongside distance? Have you thought about weight as a modifier for converting half pace to full marathon? It might help explain why women are generally better at carrying their half pace to full distance. At a very basic level, we are all working with the same human muscle tissue which has the same limits in terms of absolute strength and endurance (depending on training level I guess). So, is it the case that leg muscle development moves in tandem with body weight to completely negate the increased strain of running with a heavier body? Or does leg strain increase for heavier people to the point where they start to damage their muscles considerably more during a marathon than a lighter person? Hi, are you able to tell us about the statistics on the time between the runners half and full marathon? 3 weeks vs 16 weeks apart would presumably give very different results?